Build better people – save money – grow your business. Paul has wide experience in the measurement and analysis of the impact and return on investment (ROI) from training and development, bringing a unique perspective to the discipline with over 20 years in physics research, business analytics and education management. He was the ideal choice to head the IMI ROI Programme - funded (2012/14) by the UK Commission for Employment and Skills - making and winning the economic argument for investing in skills. 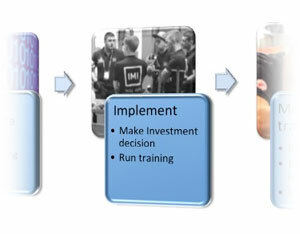 Paul now manages IMI’s Analytical ROI consultancy helping business gain high quality insight from isolating the bottom-line impact of training performance on productivity, efficiency and the customer experience.